DEPUTY LEADER OF Fianna Fáil Dara Calleary has said it was “premature” for Councillor Sorcha McAnespy to be told she would be a Fianna Fáil candidate at the next local elections in the north. The Tyrone councillor was announced as a candidate at an event last night without the full backing of the party. However, she states she was told by Fianna Fáil leader Micheál Martin that “she would be the candidate” in the next elections. Utter confusion has reigned since yesterday’s event in Tyrone when McAnespy, who is an independent councillor, and a member of the Fianna Fáil’s national executive, was announced as the party’s candidate in the local elections. Standing next to TD Éamon Ó Cuív, the spokesperson on Regional Development, Rural Affairs and the Gaeltacht, as well as Senator Mark Daly, McAnespy was holding a photo of herself with the Fianna Fail branding. Yesterday evening, the two politicians announced that they were the directors for her election campaign. “There is an appetite now more than ever for Fianna Fáil to contest elections in Northern Ireland. Micheál Martin made the commitments in 2013 to contest local elections in 2019 and I was delighted when he confirmed I would be a candidate for Fianna Fáil in the upcoming local elections in 2019,” said McAnespy. However, the party has since rolled back on the announcement in a tweet last night. Despite some reports, the party has made no decision with regard to contesting the 2019 NI local elections. The party is continuing its discussions with the SDLP. Despite some claims and reports, the Fianna Fáil Party has made no decision on whether or not it will contest elections in the North. It follows then that it has selected no candidate to contest these elections. Discussions between the party and the SDLP are ongoing and a statement on our future intentions will be made in due course. Last night, McAnespy said she was informed by Martin that she would be supported by the party at a private meeting which took place a number of months ago. She stated this morning that she spoke to him in April. When asked if this was the case, and if Martin told McAnespy she would be a candidate, a spokesperson for the party said: “No comment.” Requests for an answer were also made this morning, but the only statement issued was the one above. Asked on RTÉ’s News At One, Calleary did not confirm one way or another if McAnespy was told by the party leader if she was a candidate, but did state that “to be told that was premature”. He reiterated that the party has not taken the decision to run candidates in the north, adding that Fianna Fáil is in talks about the matter. The deputy leader was also asked if the event in Tyrone was a “fake Fianna Fáil launch”. “No, I am not getting into that territory,” he said. He would also not be drawn on whether the Ó Cúiv and Daly will face any consequences for their actions. Speaking on Raidió na Gaeltachta today, Eamon Ó Cúiv said a previous commitment had been given to McAnespy at a previous Ard Comhairle meeting. He said this was also confirmed by Ógra Fianna Fáil. Another story is coming from Dublin, he said, referring to party headquarters. 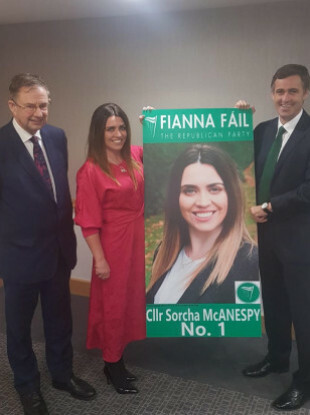 However, Calleary said today that it doesn’t matter who McAnespy is standing next to in the photo or if she has posters with the Fianna Fáil branding – the party has made no decision as of yet. Following the party line, Calleary added that when the party decides to run candidates in the north, it will take a “huge amount of time to do” and the party “will not hide away from advertising that we have made that decision”. When asked had the party’s National Executive decided that it would ratify and put forward candidates in Northern Ireland, McAnespy said that “there was a motion at the last Ard Fheis and that was discussed and voted on”. She denied that she “jumped the gun” by launching her candidacy without the full backing of the party. “It’s seven months out from the local election,” she said. She added that she wasn’t sure if she would hear from Micheal Martin today. It is believed that party HQ does not class the event in Tyrone as an “official party event” and that only the leader of the party and the Ard Comhairle can make a decision about who can run as a candidate. It is understood that some within the party believe Ó’ Cuiv and Daly went solo announcing her candidacy last night without having the authority to do so. Daly told TheJournal.ie that as “party members, a public representative and member of the national executive, she is entitled to have a Fianna Fáil meeting any time”. At last night’s event, which party sources state was not an official party event, O’Cuiv said he believed that Fianna Fáil standing in the north will “help to give proper representation to the people concerned with the day-to-day issues, we will offer fresh thinking and challenge the status quo of Sinn Féin and DUP which has led to the shutting of Stormont and dysfunctional politics”. McAnespy was also questioned today about why she would have someone who lived in Kerry launch the campaign. She said that with Fianna Fáil being an all-Ireland party, “it’s about inclusivity and demonstrating that”. It is believed a number of party members supported last night’s announcement with Cork TD and Spokesperson on Enterprise Billy Kelleher retweeting a number of tweets from the event last night, including that of President of Ógra Fianna Fáil Ian Woods which stated that he was present at the meeting in which McAnespy was told she was candidate. It is understood that party HQ is extremely unhappy with last night’s turn of events, and with the apparent solo run by the senator and the senior TD. While some Fianna Fáil TDs are supportive of McAnespy’s candidacy, another senior party member said last night’s event was an attempt by some to force Micheál Martin to take quicker action in running candidates in the north. It is not yet clear if any further action will be taken by the party against the party members. The Fianna Fáil leader Micheál Martin has long been considering running candidates in the north. In an interview about running candidates, Martin told TheJournal.ie in December that such a move was an “ongoing issue in the party” and did not rule out the prospect. Earlier this year, Martin told the national executive that preparations were at an advanced stage, adding that an announcement was expected in the autumn. In last night’s statement the party said it talks with the SDLP were ongoing. A possible merger of the two parties had been mooted. However, when asked about the SDLP joining forces with Fianna Fáil, SDLP’s Claire Hanna was asked by the BBC’s The View Programme if she would remain a member of the party if it merged with Fianna Fail. Talks between the two parties are ongoing, say Fianna Fáil. It is understood there is substantial support within the parliamentary party for organising in the north. The recent events has made the party an easy target for the opposition, with questions now being asked about what is going on internally in Fianna Fáil. Questions about Micheál Martin’s leadership are also mounting. “There are no divisions. We are very united around our role as a political party,” adding that his party is “completely united on addressing the issues. He said the “drama” around last night’s event is not relevant to the everyday person, and was quick to defend the party leader. Calleary said the party is “absolutely fully united behind Micheal Martin’s leadership”. Email “FF's deputy leader says it was 'premature' for McAnespy to be told she would be a candidate in NI elections ”. Feedback on “FF's deputy leader says it was 'premature' for McAnespy to be told she would be a candidate in NI elections ”.